Vikings Luxury Buffet, the Philippines’ largest buffet restaurant will be offering new dishes to mark the celebration of Kadayawan 2014. The Kadayawan Menu will be offered starting August 11, 2014 until August 17, 2014. The new dishes featured some Filipino favorite dishes with a Davao twist. Vikings SM Lanang also launched Traveler’s Discount : Kadayawan Festival Edition where local and foreign tourists will receive 10% discount when paying in cash or 5% discount when paying in card. In order to avail of this special promo, a tourist must present a valid boarding pass or a travel ticket supported by a passport or government issued ID to prove that he/she is a tourist visiting Davao City during the Kadayawan Festival. Tickets/boarding passes should show that the visitor arrives in August 2014. If in case the tourist has arrived via land transport, a copy of the bus ticket and any document with proof of residency like voter ID, driver’s license, etc will be honored. Here’s a glimpse of what to expect when dining at Vikings SM Lanang Premier during the Kadayawan week. The menu features dishes using durian and mangosteen – two of the most abundant fruits in Davao Region. 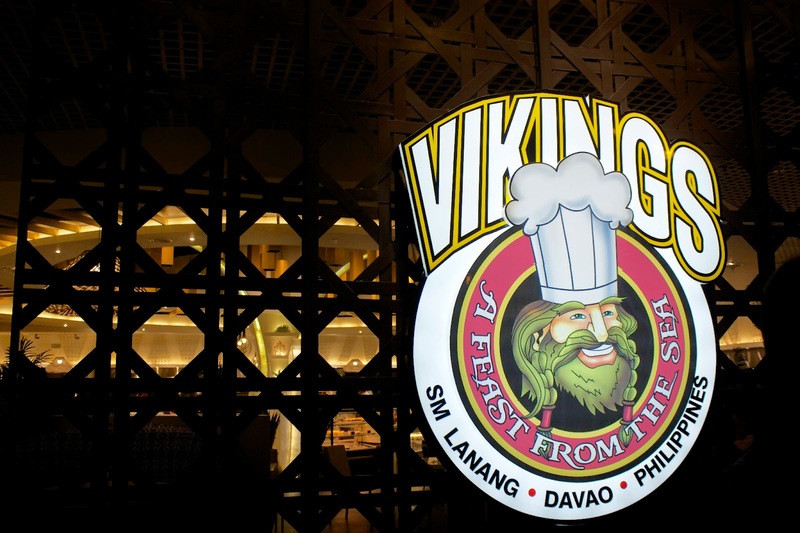 Vikings offers a different taste of this classic Filipino favorite. They used Tinapa and Mangga instead of the usual pork meat. Suprisingly, it tastes good especially when you dip it in their spicy vinegar sauce. A Filipino starter with a twist. The Malunggay pesto complements well with the grilled eggplant. You may try this dish even if you are not a fan of balut. It tastes good actually. The crispy bagnet added texture to the salad. It’s something unique which visitors should try especially those who are craving for bagnet from the Ilocos Region. Vikings special kinilaw is a mixture of fresh tuna and salmon with pork, cucumber, radish, seaweed and pomelo. Balbacua is a popular soup in Mindanao. It consists of cow/buffalo’s skin and ligaments simmered for hours and served hot. A traditional Filipino soup which makes you wonder why it’s called Pancit where in fact it’s made of pork dumplings and not pancit (noodle). The dish originated from the town of Molo in Iloilo. A famous dish from the Bicol Region, Laing has become a Filipino favorite dish all over the country. Vikings’ version has the right salty taste with a kick of chili. Vikings’ Gising-gising uses kangkong instead of the usual main ingredient which is beans. The dish will literally wake you up. It has generous amount of chili paste which make the dish really spicy. A Filipino style Paella which I can pretty much compare to adobo rice. It uses a regular rice instead of the usual sticky rice in the traditional Paella. It’s made from fresh, thick egg noodles with savory sauce. This is something different as it uses bihod (female tune eggs) as main ingredient in this pasta dish. This one is a must-try. So head to Vikings this Kadayawan 2014. It’s mud crabs in rich and flavorful coconut milk sauce. Imbao is a seashell which is abundant in Davao region. Vikings’ baked imbao is topped with cheese and spinach. A classic Filipino dish made of chicken and spices such as garlic, pepper, vinegar, and soy sauce. The mangosteen sauce complements with the savory taste of the rellenong manok. The sauce makes the dish more flavorful. A classic recipe with a Davao twist. Baked Kalderetang kambing topped with mozzarella cheese. Another classic dish with a Davao twist. The barbecue sauce has durian flavor. The durian taste is not overpowering, it has the right amount of durian flavor in it. A separate durian sauce is also added so guests can drizzle as much as they want. Another must-try dish during Kadayawan. The durian taste is very subtle that you want more after your first bite. Definitely a must-try dessert at Vikings this Kadayawan season. It’s my all-time favorite dessert. It’s not too sweet so I loved it. It is topped with fresh mango and watermelon. Cheesecake with bits of mango and preserved bananas on top. A Filipino dessert made of layers of buttercream, meringue, nuts and fresh mangoes. So, if you’re planning to celebrate Kadayawan Festival 2014, head to Vikings Luxury Buffet at SM Lanang Premier and sample their sumptuous and mouth-watering dishes and desserts especially offered during the Kadayawan 2014 week only. Disclaimer: Actual presentation during buffet may differ a bit but the taste will be equally the same.